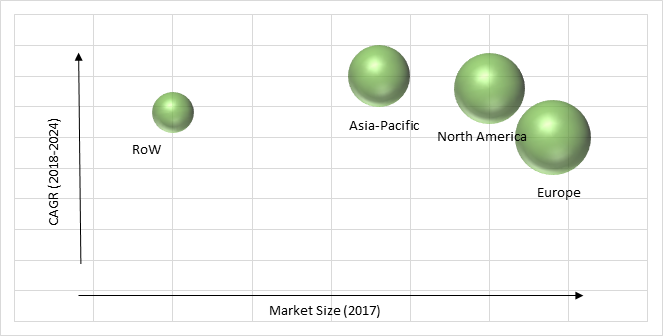 The global energy harvesting system market is set to reach USD 843.2 million by 2024, growing at a CAGR of 11.5% during the forecast period. The growth of this market is attributed towards excessive demand for durable, safe and power-efficient systems that necessitate least amount of maintenance along with increasing initiatives undertaken by government authorities towards green energy. Energy harvesting systems develops diverse arrangements established upon the amount, source and type of energy that is converted into electrical energy. This harvesting system utilizes a source of energy such as light, vibration and heat. On the basis of technology, the energy harvesting system market is segmented into vibration, radio frequency (RF), light and thermal. Among all these segments, light energy has been generating largest revenue throughout the estimated period and will continue to be the most used technology during the forecast period. The large market size of light energy segment is due to massive accessibility of advanced applications and availability of sunlight in the solar energy domain across the globe. Based upon component, energy harvesting system market is categorized into transducer, storage battery, and PMIC. Among all these components, transducer is anticipated to witness highest CAGR of 12.1% during the forecast period. The extensive growth of this segment is pertaining towards excessive utilization of IoT by several industry domains, technological enhancement in networking and power intelligence across the world. Moreover, reduced costs of actuators and sensors are another factor driving the growth of transducer that is thereby strengthening the growth of energy harvesting system globally. Transducer is further subcategorized into photovoltaic, piezoelectric, electrodynamic, electromagnetic, RF transducer and thermoelectric. On the basis of application, energy harvesting system market is classified into Industrial, Building and Home Automation, Consumer Electronics, Security, and Transportation. Of all these applications, building and home automation is observing increasing demand in the energy harvest system market across the globe. Extensive increase in installation and execution of sensor-based techniques along with increase in demand for energy proficient power systems from commercial domain to residential domain. The exaggerating emphasis on energy harvesting from various sources such as wind, solar and thermal power along with excessive efforts from various government organizations to drive the utilization of renewable energy sources are the major factors that are driving the growth of energy harvesting system market globally. With the alarming rate of air pollution and global warming government organizations are continuously making determinations in order to eliminate the dependence and overutilization of fossil fuels and hence stimulate the adoption of renewable energy sources. Furthermore, increasing procedures for diminishing of carbon footprints worldwide is another factor pertaining towards the growth of global energy harvesting system market. Additionally, ever-changing patterns in rainfall and soaring temperatures are further fluctuating the budding arrangements of plants thereby strengthening the requirement of energy harvesting system and thus increasing its market revenue. Lack of standardization and consumer awareness is expected to further hinder the growth of global energy harvesting system market. Moreover, the availability of abundant encrypted devices and ecosystems reduces the efficiency of energy harvesting system industry that is less user-friendly and restraining the growth of energy harvesting system market across the globe. Globally industry players operating in energy harvesting system market are leveraging market growth by launching new products in the market that is further enhancing their products portfolio. For instance, EnOcean GmbH launched self-powered wireless sensors in IoT for energy harvesting solutions that is based upon standardized specifications. Geographically, energy harvesting system market in Europe is the largest revenue holder, globally. The growth of energy harvesting system market in this region is attributed towards widespread adoption of this system in automotive domain for the establishment of both commercials as well as passengers’ car segment. Moreover, Asia-Pacific is expected to witness the highest CAGR during the forecast period owing to exaggerated growth in both manufacturings as well as construction domain in various emerging countries of this region. The key players operating in the energy harvesting system market includes Fujitsu Group, Arveni, Cymbet Corporation, Convergence Wireless, Powercast Corporation, Honeywell International Inc., Texas Instruments Incorporated, STMicroelectronics N.V., ABB Ltd., Bionic Power, Inc., Energy Partners, Yantra Harvest Energy Private Limited, and EnOcean GmbH. Table 157 Snapshot – Honeywell International Inc.
Table 159 Snapshot – STMicroelectronics N.V.
Table 160 Snapshot – ABB Ltd.
Table 161 Snapshot – Bionic Power, Inc.